Over the next five weeks, Your Levy @ Work will be deciphering the detail of the SIP and explaining what the top priorities of the plan mean for your business and, more broadly, the nursery industry. How will the nursery industry increase sales of green life products by four per cent per annum over the next five years? That’s one of five key areas addressed in the recently released 2017-21 Strategic Investment Plan (SIP) for the nursery industry, which seeks to ensure a stronger, more sustainable future for growers. With 99 per cent of nursery stock sold domestically, the industry is constantly looking at innovative ways to lift demand and sales for green life across the country. One of the key initiatives developed to help achieve this is the levy-funded 202020 Vision which is underpinned by an ambitious target to increase green life in urban areas by 20 per cent by 2020. 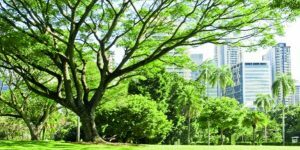 Since its inception in 2013, this national marketing program has unveiled many benefits for industry including a push for more canopy cover in urban areas and documenting the associated health benefits for humans. It aims to position the nursery industry as a “go-to” source for solutions on how people can interact with nature to improve their lives, their health and their wellbeing. Having initially focused on ‘influencing the influencers’ such as councils, town planners and architects in the past few years, the initiative is now moving into a consumer phase so as to leverage off the growing ‘green movement’. As outlined in the latest SIP, the consumer program will help to identify and promote the benefits of green life products to everyday Australians, suggesting different species to purchase and their various uses around the home and workplace. Obtaining a better understanding of consumers, their requirements and their reasons for purchasing green life products forms a key part of outcome one of the SIP – and is something production nurseries can help to play a key role in. Growers who have an interest in, or passion for, the consumer program are strongly encouraged to provide their ideas on how their marketing levy be invested in the next stage of 202020 Vision, as a way of generating more interest and sales across the board. There’s a number of ways to get involved such as lodging a project idea via the Hort Innovation website, contacting a member of the SIAP committee, or by simply registering for updates from the 202020 Vision team. More broadly, the outcome also outlines the need for industry to maintain good engagement with key enablers of major green space projects such as local governments, developers, landscape architects and town planners. This continued engagement at both the decision-maker and consumer level, together with consistent communication with growers about their role in 202020 Vision, will be critical in ensuring its success. Next week, Your Levy @ Work will be examining outcome two of the latest SIP which is all about increasing marketing effectiveness and efficiency based on more data and industry insights. Stay tuned for more!